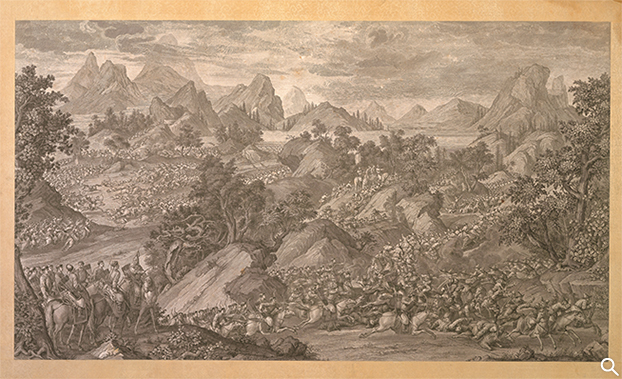 Poem to the "Receiving the surrender of the Yili"
Also known as “Kalmuk Ayūsi Attacking Dawaachi’s Camp on Mount Gädän,” this illustration depicts a decisive battle where the Qing army defeated the Dzungars and gained control over the northern marches of the Tianshan Mountain. 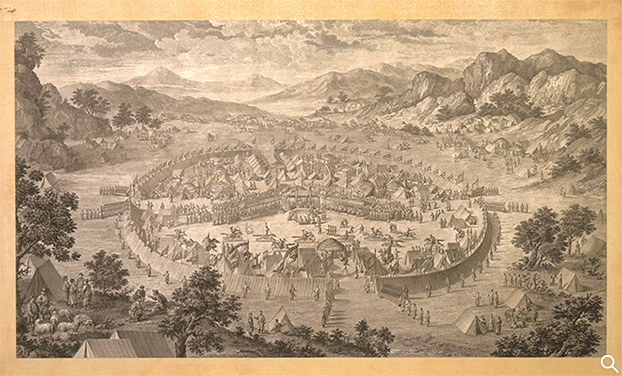 The historical account goes that one night in the late spring of 1755, General Ayūsi (n.d.), who was a former enemy surrendered to Qing, took twenty two horsemen to launch a surprise attack against the main camp of Dawaachi (?-1759), the Dzungar rebel leader. 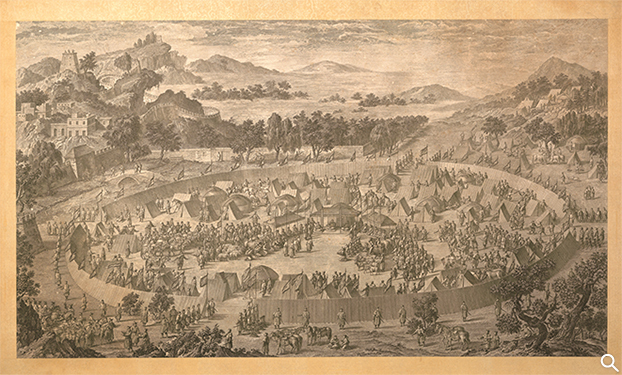 In this illustration, we can see Dawaachi’s camp at Gädän-Ola was heavily defended and equipped with several cannons. 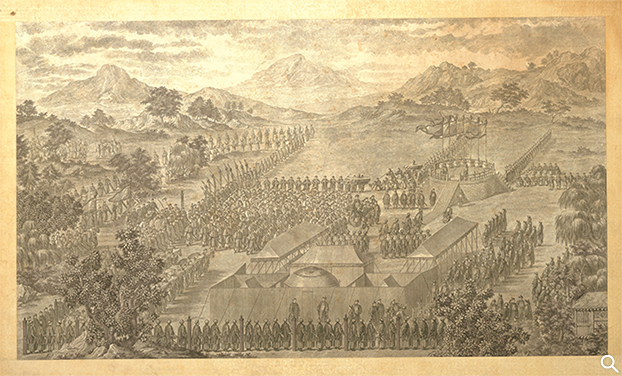 Ayūsi approached the enemy camp from a hidden trail. 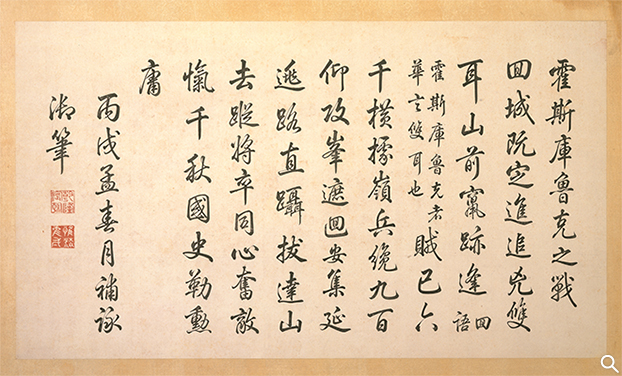 However, he was found by the enemy. 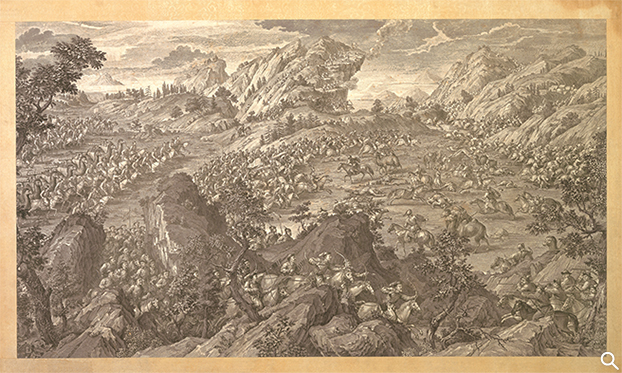 All of a sudden, Ayūsi charged into the enemy camp with a lance, followed by his horsemen. 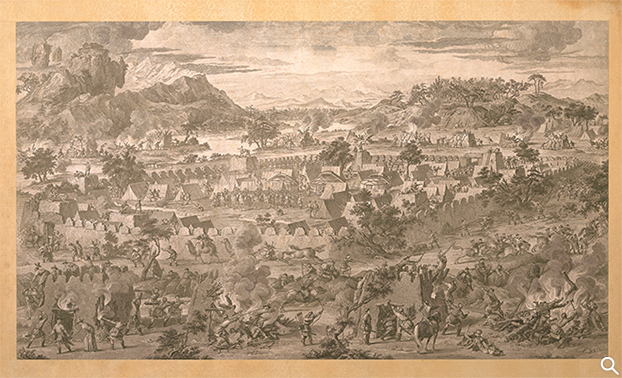 He bravely entered enemy territory without any fear. 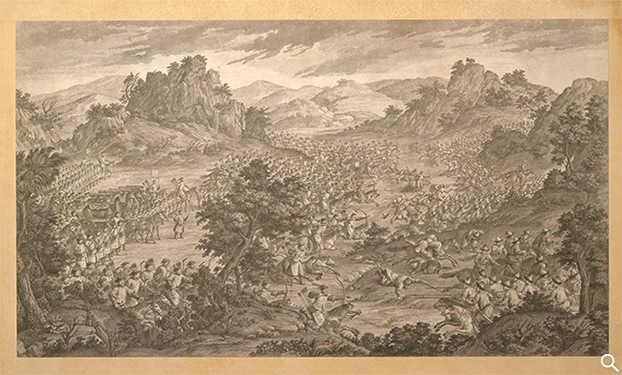 Dawaachi’s soldiers were taken by surprise, and so scared that they ran into each other. 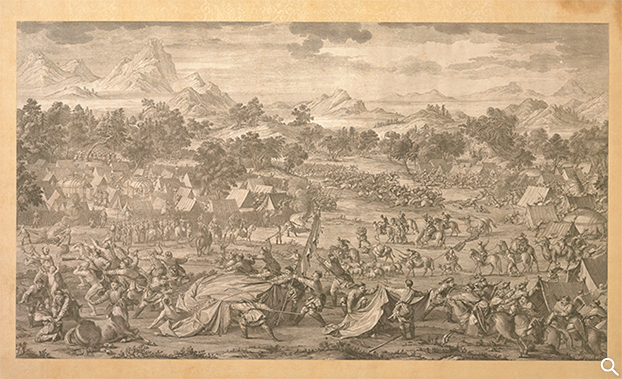 This illustration was drafted by Giuseppe Castiglione (1688-1766), who rendered the scene on the battlefield rather realistically. 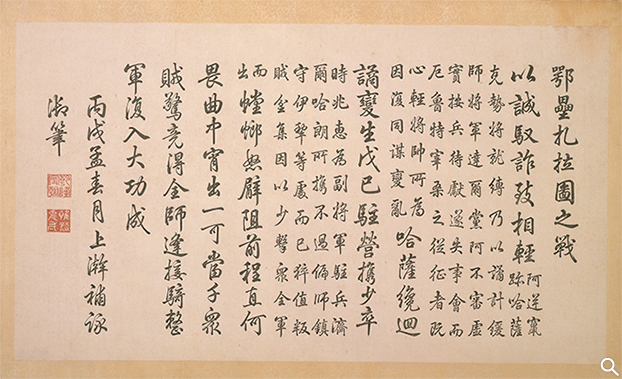 By finely presenting the human figures’ facial expressions and emphasizing spatial depth, the viewer can easily feel the sense of danger of the campaigns and the tension of men against men. 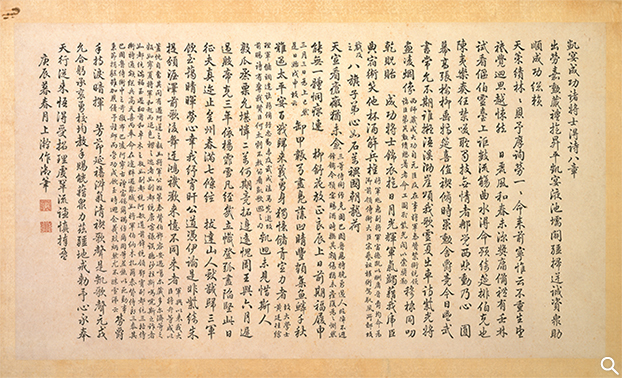 We can see Ayūsi, riding a black horse with a lance in hand, stabbed his weapon into an enemy’s chest. 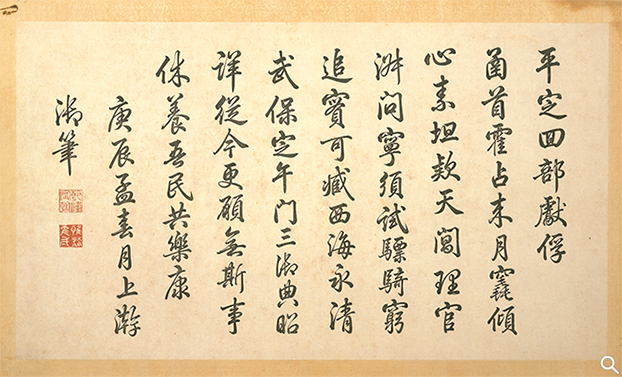 After the end of the battle, Emperor Qianlong not only commissioned Giuseppe Castiglione to paint Ayūsi Scattering Rebels with Upraised Spear, but also wrote a poem to tell the story and praised his loyalty and bravery. 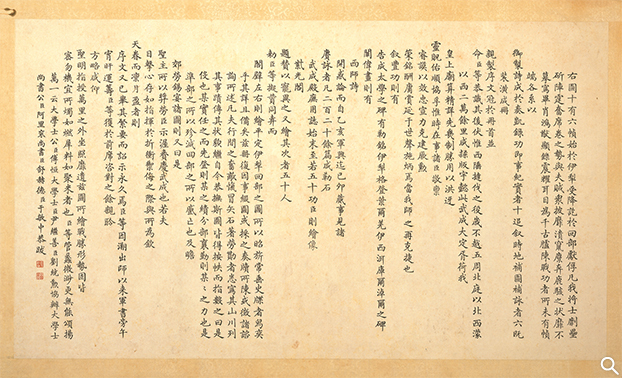 Engraved by the Qing Imperial Household Department. 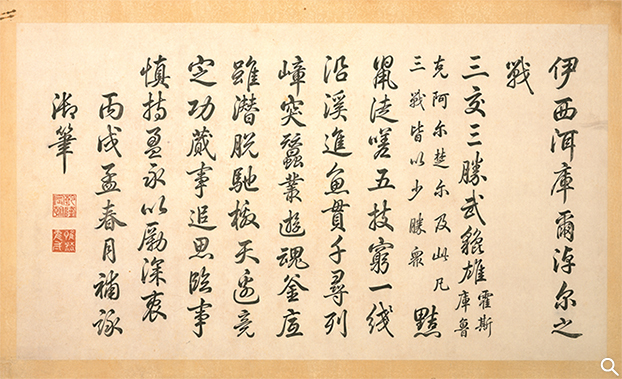 Poem to "The Battle of Oroi-jalatu"
Poem to "The Victory of Khorgos"
Poem to "The Battle of Khurungui"
Poem to "The Chief of Us (Turfan) Surrenders with His City"
Known in Mongolian as Karausu, the Black Water River is on the upstream of Xinjiang’s Yarkand River. 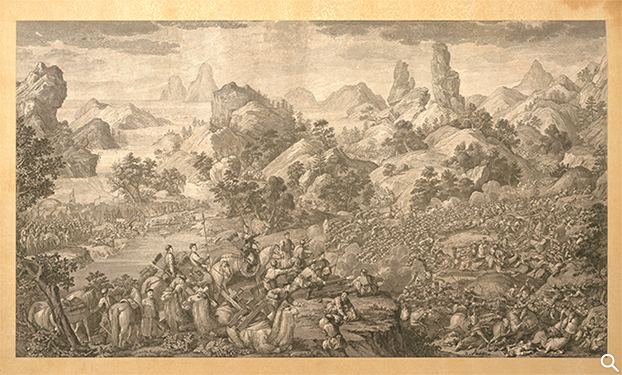 The “Lifting of the Siege at the Black Water River,” drafted by Giuseppe Castiglione, depicts the story of the Qing general Zhaohui (1708-1764) and his legendary break-out of a blockade. 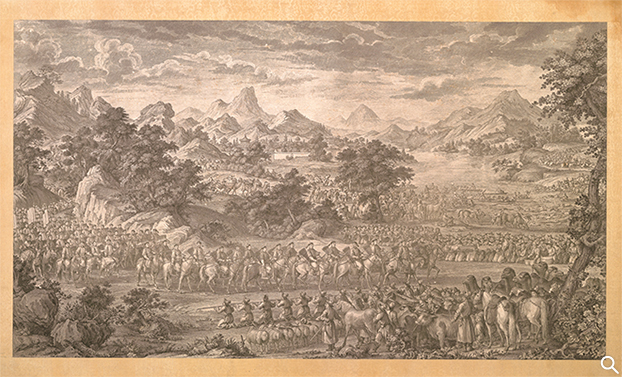 In the early spring of 1759, General Zhaohui and his troops were besieged by rebels in Yarkand until the arrival of reinforcement. 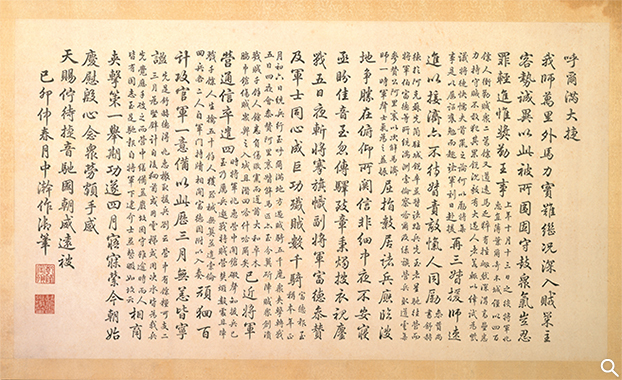 Emperor Qianlong wrote a poem “Lifting of the Siege at the Black Water River” to describe the battle in detail. 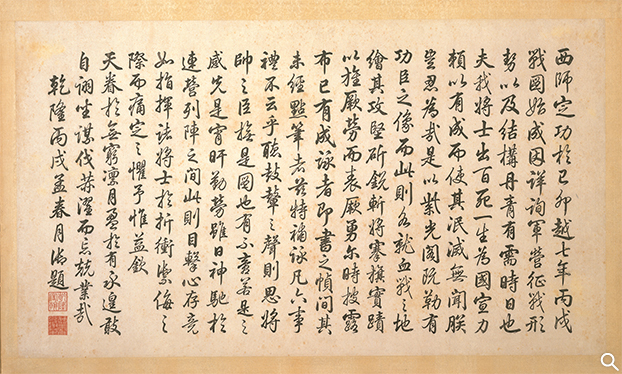 The hardship and difficulties experienced by the Qing army can be inferred from the densely layered mountains and clouds in the background. 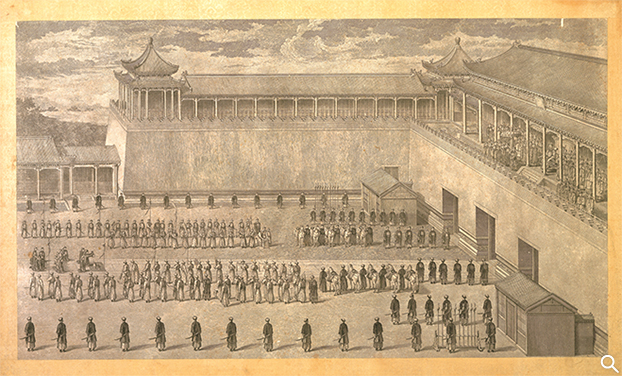 The Qing’s fortification is on the left side. 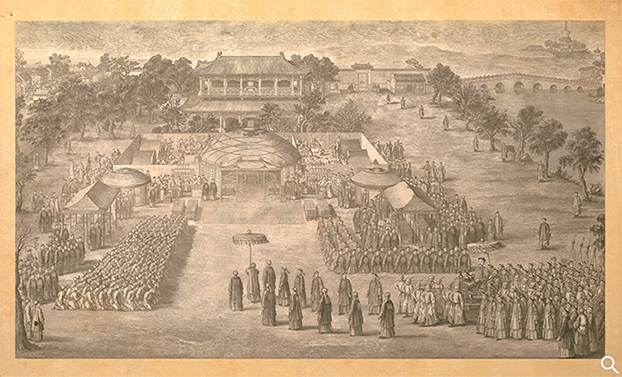 General Zhaohui, holding his horsewhip high in the air, is placed at the center. 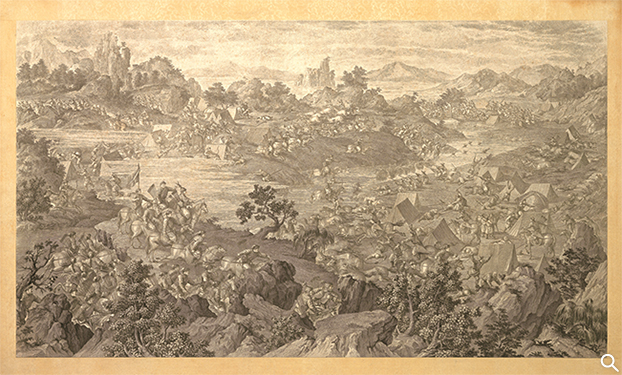 Calm and collected, he is in full armor and directs the soldiers with confidence. 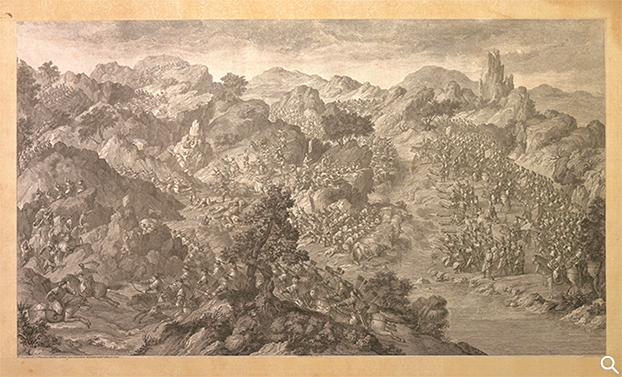 His fortitude and persistence under pressure seem to have the power to keep his soldiers on an even keel, and to boost their morale. 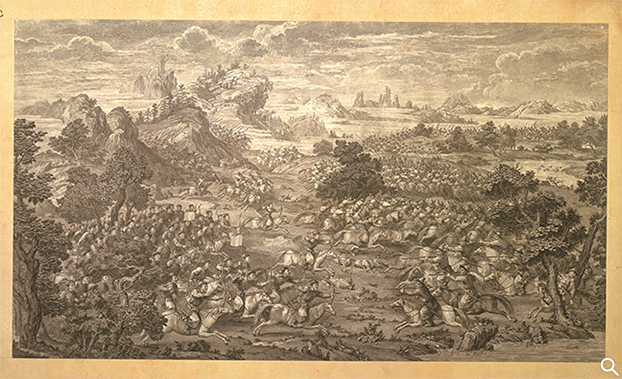 On the right side, the reinforcement forces coming to the rescue launch attacks against the rebels from various fronts. 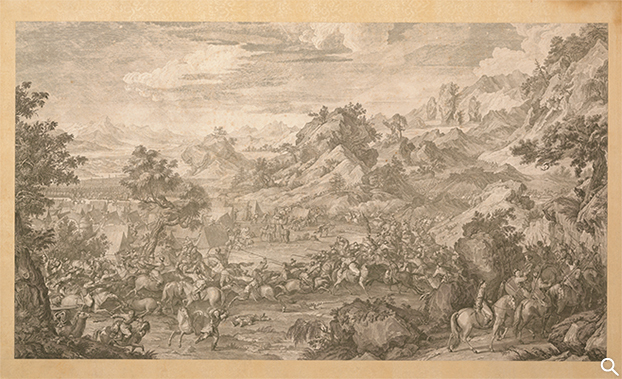 While the various parts of the illustration were drawn separately in different times, they were seamlessly patched together, attesting to Castiglione’s dexterity in illustrating battlefield scenes. 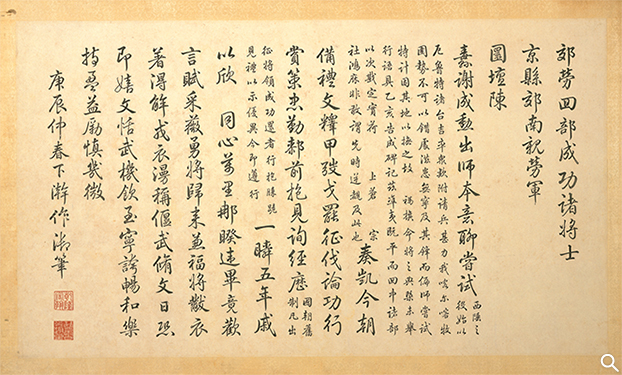 It is also an authentic and vivid record of the Qing army’s defeat of the rebels. 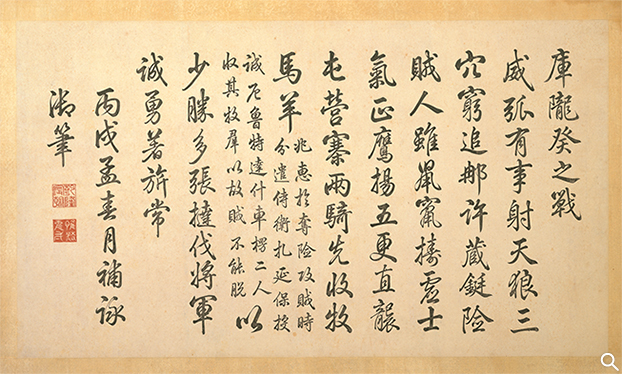 Poem to "The Great Victory of Qurman"
Poem to "The Battle of Tonguzluq"
Poem to "The Battle of Qos-qulaq"
Poem to "The Battle of Arcul"
Poem to "The Battle of Yesil-köl-nor"
Poem to "The Chef of Badakhsan Asks to Surrender"
Poem to "The Emperor is presented with Prisoners from the Pacification of the Muslim Tribes"
Poem to "The Emperor in the Suburbs Personally Receives News of the Officers and Soldiers Distinguished in the Campaign against the Muslim Tribes"
Poem to the "A Victory Banquet Given by the Emperor for the Distinguished Officers and Soldiers"
Written by Fu Heng, et al. 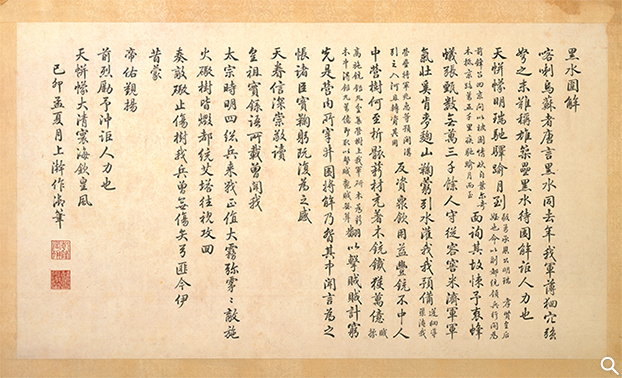 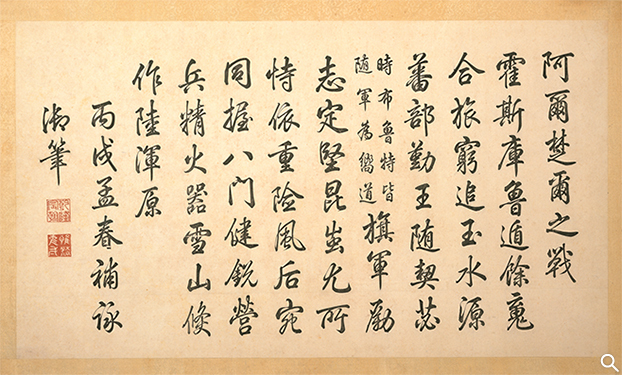 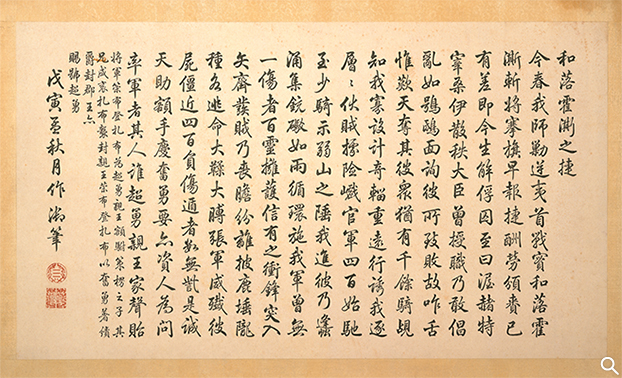 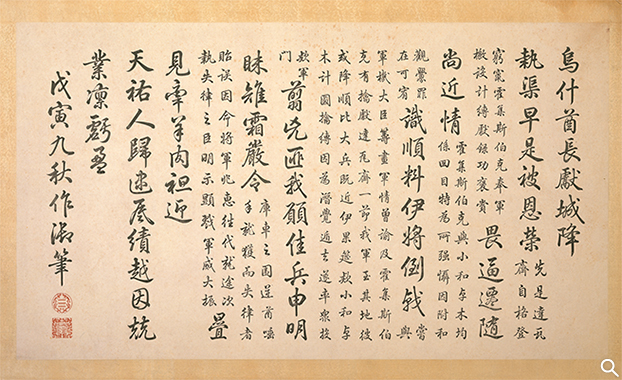 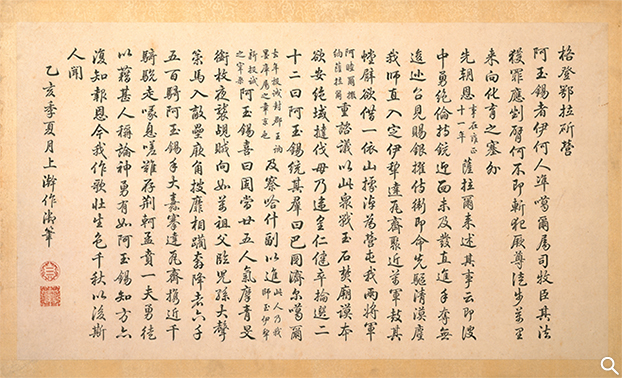 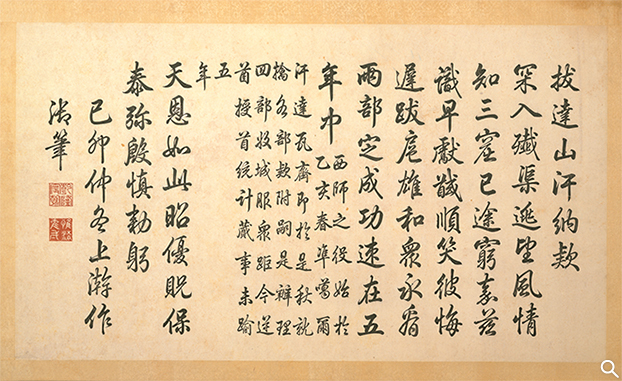 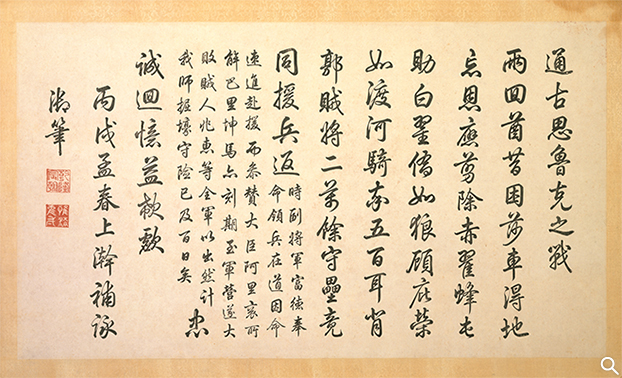 Appended to the sixteen copperplate prints, the postscripts were written by the Grand Secretary Fu Heng (1720-1770) and other court officials, such as Grand Secretaries Yin Jishan (1695-1711) and Liu Tongxun (1698-1773), as well as Ministers Arigun (?-1769), Shu Hede (1710-1777) and Yu Minzhong (1714-1779), who either fought on the battlefield, attended to logistics management, or took part in the compilation of military annals. 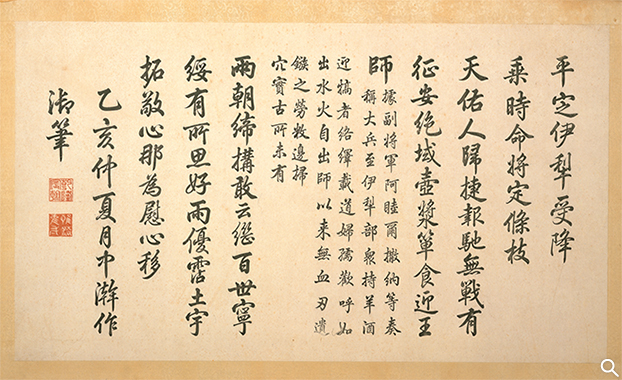 Among them, Fu Heng, Arigun and Shu Hede were even given the honor of being portrayed as meritorious statesmen, whose portraits were displayed at the Ziguangge Pavilion.